Packed with great details, such as an open fire with chicken, wooden logs, tree and opening doors and windows, this log cabin is an ideal base for a wildernessadventure. Minifigure with backpack, paddle and canoe included. For something different, rebuild it into a country retreat or a river hut…. Also features open fire with chicken, wooden logs tree, opening doors and windows and horn ornament. Unique dark red roof; Mini figure with backpack, paddle and canoe included. 3 models in 1: Rebuilds into a country retreat or a river hut. Features removable roof and hinging wall section for greater access. One supplied; Size H26.2, W38.2, D5.65cm; For ages 7 years and over; Manufacturer’s 2 year guarantee; EAN: 5702014732735. WARNING(S): Not suitable for children under 3 years old. * . 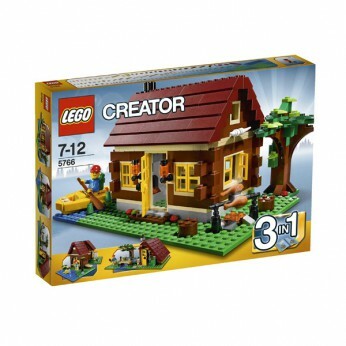 This toy costs approximately £22.99 (for the latest and best prices make sure you check our retailer list for the LEGO Creator Log Cabin 5766 above). In our review of LEGO Creator Log Cabin 5766 we classed it as being suitable for ages 6 years, 7 years, 8 years, 9 years, over 10 years but recommend you check the manufacturer specific advice before purchasing.